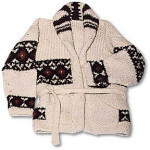 From the personal wardrobe of Marilyn Monroe: A hand-knitted cardigan of cream wool decorated with a brown geometric pattern across the center, cuffs and the neck, with matching knitted belt. Worn by Marilyn Monroe in 1962 and featured in a series of photographs by George Barris taken on the beach in Santa Monica, California. Also worn by Marilyn on June 1, 1962 (her final birthday) as she left Fox Studios for the last time during filming of “Something’s Got To Give.” She never returned to complete another day of shooting on the film.